Songbirds will sing their praises! By their fruits you shall know them, Matthew 7:16 tells us, and here, the sanctuary from our Cotton Collection offers a bounty of beauty and care for birds, people and the planet. 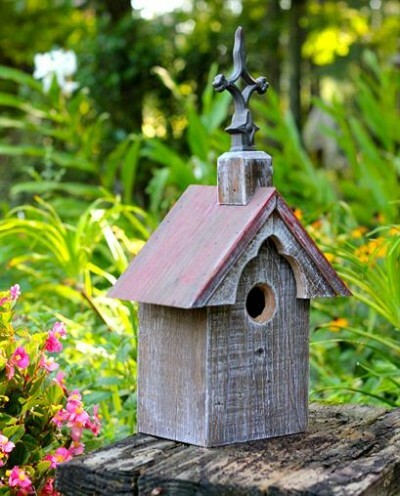 The cypress is reclaimed, and the construction is pure Heartwood - which is to say we've put all our hearts into making this a cherished addition for your home and garden, and especially for your birds. Place against a wall or other vertical surface with its attached hanger or attach a mounting plate (not included) to its base to pole mount it. A removeable back disc make for easy seasonal cleaning. Every house in The Cotton Collection is unique - no two are alike! Each item will vary due to the texture and color of the reclaimed cypress wood. Made in the USA!